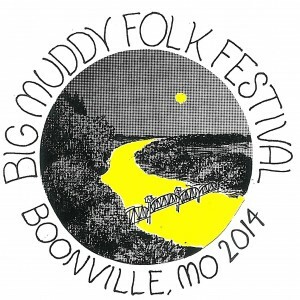 The Friends of Historic Boonville is proud to sponsor the Big Muddy Folk Festival, held in April each year. This two day, nationally-recognized folk festival focuses on traditional, ethnic and folk music with concerts, workshops, jam sessions, demonstrations, master classes, exhibits, a dance and barbeque. The Festival has been under the artistic direction of Dave Para & Cathy Barton since its inception in 1992. Under Dave and Cathy’s direction, nationally known artists have performed on the stage of historic Thespian Hall for the past 27 years! Concerts are held on Friday and Saturday nights at historic Thespian Hall (522 Main Street), the oldest continuing operating theater West of the Allegheny Mountains. Concerts begin at 7:00 pm and feature 5 to 6 different artists each evening. Click here to purchase tickets or call 888-588-1477. Tickets go on sale in January 21, 2019, at 10:00 a.m..
Vocal, instrumental, and dance instructional workshops are offered on Saturday from 9 am – 3 pm. Workshops are located within walking distance of Thespian Hall and are lead by various festival performing artists. Workshops change every hour offering a variety to satisfy everyone’s interest. Workshop fee is just $5.00 for the day or free with a purchase of a festival series tickets. A schedule will be posted to this website closer to festival time. Reservations for the workshops are not required. Jam session are held in various times through the festival. Bring your instrument and join in! A fundraising barbeque is at historic Turner Hall on Friday and Saturday from 11 am – 7 pm each day. All proceeds go toward general operation expenses for the Friends’ organization. Come and enjoy mouthwatering BBQ prepared by Terry Smith and his BBQ team awhile helping support our organization! In January we will be sending out “The Soundings”, a newsletter with all the programming details for the upcoming festival. If you would like to be added to our mailing list please email fohboonville@gmail.com with your name and mailing address.